Forest Service researcher John Schelhas and landowner Eleanor Cooper Brown discuss her family’s forest land. Photo by USFS. After the Civil War, former African American slaves were deeded or bought property across the South, but in subsequent years often lacked the money for — or were denied access to – the legal resources needed to establish title to the land. As a result, much of this land was passed down through following generations without title and is now “heirs’ property,” which means it’s held in common by all heirs, regardless of whether they live on the land or pay taxes. Over the past century, African-American rural landholdings in the South have declined rapidly, dropping from a peak of about 15 million acres in 1910 to less than 2 million today. The causes are multiple: outmigration, voluntary sales, foreclosures, and lack of access to credit and capital — as well as outright exploitation of the instability of heirs’ property ownership. Much of this land is forested, but lack of clear title has limited landowners’ access to federal and state forest management incentives and services. 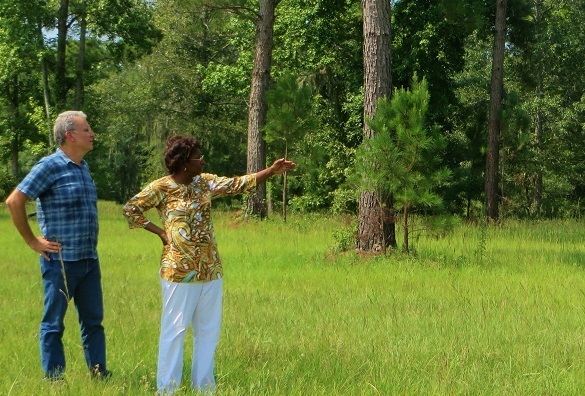 U.S. Forest Service scientists recently published results from interviews with African American landowners that provide important baseline information for new efforts to improve African American land retention and forest management. The interviews revealed a deep connection to the land and the importance of family land ownership across generations — as well as knowledge of the title issues that have limited participation in forest management. Led by John Schelhas, research forester with the Forest Service Southern Research Station (SRS) Integrating Human and Natural Systems unit, the interview studies are part of an integrated research and outreach effort included in three pilot projects started in different areas of the South by the Sustainable Forestry and African American Land Retention Program, whose purpose is to help stabilize African-American land ownership across the Black Belt region of the South by preventing and solving problems of insecure land ownership caused by heirs’ property. The program, a partnership of the U.S. Department of Agriculture and the U.S. Endowment for Forestry and Communities, also focuses on increasing forest health and economic viability by connecting African American landowners to organized networks of forestry support as well as federal and state programs. The scientists formed an interdisciplinary social science team that interviewed 20 family landowners in each of the pilot program states – North Carolina, South Carolina, and Alabama – using rapid appraisal techniques originally developed to gain a broad understanding of complex social and agricultural systems in a short time to support project development. The 20 landowners in each state were evenly distributed between core participants in the pilot projects and non-participants. Nearly two-thirds of the primary family members interviewed were between 51 and 70 years old and tended to be highly educated, with nearly 60 percent holding advanced college degrees compared to 23 percent of all forest landowners across the South. Acres of land owned were small, but appropriate for forestry, with the majority of holdings falling between 21 and 100 acres. About 40 percent of African American landowners interviewed for the study faced heirs’ property issues on some or all of their land. Most landowners interviewed had very limited experience with forestry, with only 12 percent having a written forest management plan and only 15 percent having participated in any government assistance program before taking part in the pilot program. For many owners, the Sustainable Forestry and African American Land Retention Program was their first opportunity to become involved in forestry, and the program was seen as key to involving the larger African American community with the land and retaining forestland for future generations. The Sustainable Forestry and African American Land Retention Program is jointly supported by the Forest Service, the U.S. Endowment for Forestry and Communities, and the USDA Natural Resources Conservation Service. Read more about the pilot projects of the Sustainable Forestry and African American Land Retention Program in the February 2016 issue of Leaves of Change, the bulletin of the SRS Centers for Urban and Interface Forestry. For more information, email John Schelhas at jschelhas@fs.fed.us. « Older Previous post: Here Today or Here to Stay?